Hi, everyone! I have a card to share with you really quickly. When I was looking at all the Dynamic Duos entries last week, I saw one where the stamps had been inked with multiple colors, in a striped pattern. I wanted to copy that! Then I got to playing around, and striped turned into ombre, and then I had this stinking COOL “MERRY” sentiment. It took a while to figure out where to go with my card from there. I looked on my desk, and I had these snowflakes, which had been by-products of some Christmas tags I’d made. 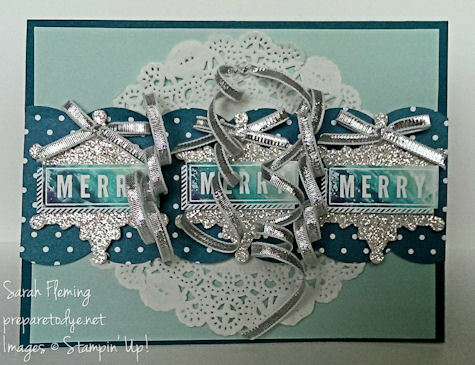 So I decided to use some of those up, and I knew the 1/8″ Silver Ribbon would be a fun addition to the card as well. The ribbon took me forever to place and curl just so, but I was happy with the final arrangement. I hope you like the card. You can find all the supplies I used to make my card in my online Stampin’ Up! store, 24/7. Have a great day! I’m really excited about this one and am ordering mine today. 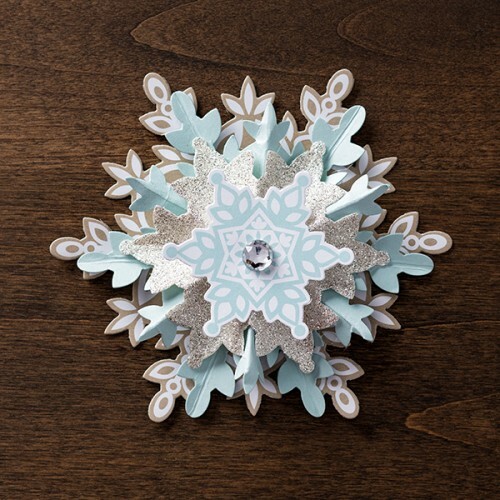 The Festive Flurry Ornament Kit is a kit to make 10 of these beautiful snowflake ornaments. I have all the supplies to make these myself, but I’m so happy to have all of the work done for me. I know I will use several as ornaments (and possibly gifts) and will make some into a small banner. See more details and the video that shows how easy these are to make here.